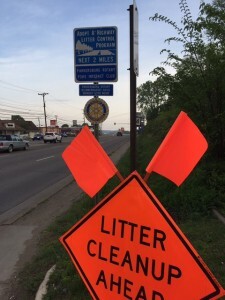 Wood Co. 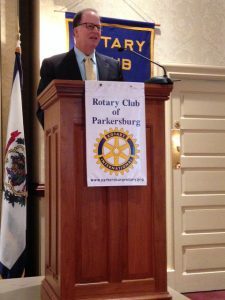 Clerk, Mark Rhodes outlined the many duties of his office during the August 29 weekly meeting. Rhodes succeeded Jamie Six as County Clerk and later won by five votes over his opponent out of 22,000 votes cast in the general election. 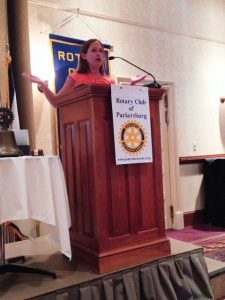 At the August 22 meeting, SmallTalk founder and CEO, Erin Augenstein (Twitter handle: @erinaug) told Rotarians that social media apps like Facebook are valuable tools in obtaining new customers who are often seeking referrals and advice rom their Facebook friends before purchasing. 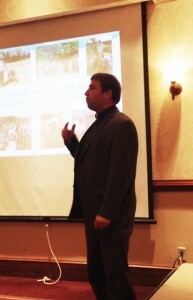 Augenstein consults with area small businesses on social media strategy. WTAP’s Jim Wharton shares 40 years of sports memories. 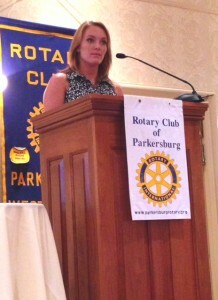 WTAP TV Sports Director/Anchor served up 40 years of sports memories to Rotary club members on August 15. Wharton said that covering WVU bowl games have been bitter-sweet affairs since often games come with national prestige at prime sports venues. The only thing is, when he has traveled to cover them instead of an assistant, WVU has lost six times. Despite that, Wharton said he has 40 years of good memories of covering Mid Ohio Valley sports, and looks forward to many more. Following the meeting, when asked if the Chicago Cubs will finally win a World Series this year, Wharton said that “this is their year.” He expressed his hope to see the Cubs and the Indians in the 2016 World Series. 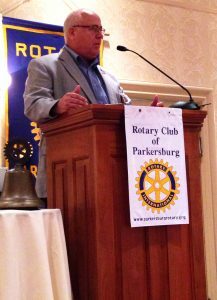 Check out our Facebook page to see Jim’s connection to the Parkersburg Rotary Club. http://parkersburgrotary.org/wp-content/uploads/2016/08/Jim-Wharton-e1471354919797.jpg 640 480 admin http://parkersburgrotary.org/wp-content/uploads/2012/07/rotarycentersm.png admin2016-08-16 13:45:512016-08-16 16:37:48WTAP's Jim Wharton shares 40 years of sports memories. 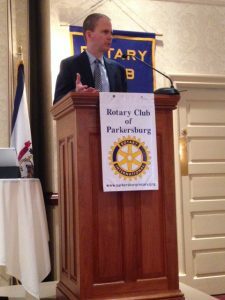 OVU’s Jeff Dimick discusses new alternative energy plant to be housed at old Dover-Parkersburg plant site during August 8 Rotary Club meeting. 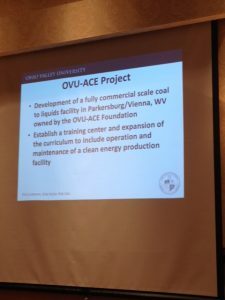 Dimick said the plant will convert West Virginia coal into liquid energy through gasification. The project will also include area colleges anduniversity students the chance to study alternative energy management. 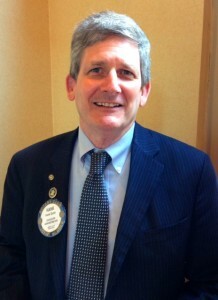 Rotary District 7530 District attorney Governor, David Raese spoke to the club on July 25. DG Raese said each club needs to focus mainly on two things: Increasing membership by a net of two members per club; and raising dollars and awareness for Polio eradication. 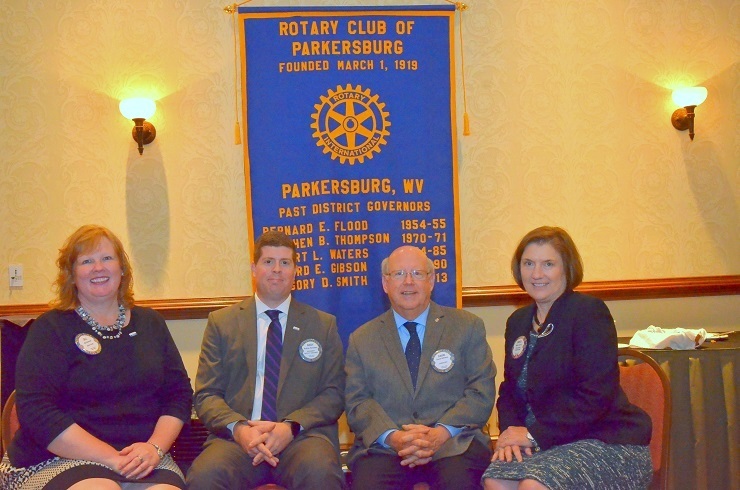 Raese also encouraged Rotarians to attend next year’s international convention in Atlanta, GA.
Dr. Hank Dunn, WVU-P was welcomed as the club’s newest member during the July 11 meeting. 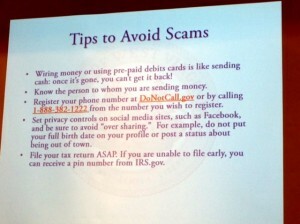 Brooke Fletcher, Consumer Representative with the WV Attorney General’s office spoke to the club at its July 11 meeting about scams and to how protect yourself and family members from them. 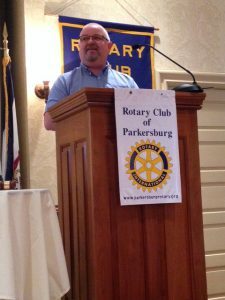 Fellow Rotarian, and Christ Lutheran Pastor, Ian Reid spoke to club members about the community gardens his church has operated successfully for the past few years. Free produce is made available three days a week to community members from all walks of life regardless of income. Reid stressed that the garden is a community effort regardless of which church one attends.